Last summer I spent a month with my family in the town of Delft, in the Netherlands. Delft is the home of Johannes Vermeer, famous for his Girl with a Pearl Earring, The Milkmaid and The Little Street. But Delft was also home to Anton von Leeuwenhoek, who discovered the existence of microscopic life and, having discovered it, spent the rest of his life as its obsessive explorer. Vermeer and Leeuwenhoek were born in Delft on the same day in 1632. They would have gone to the same market. That they knew each other, or at least had met, seems inevitable. The big question of whether the work of one man influenced the work of the other is the harder one to answer. The way this question is usually posed is to wonder whether Leeuwenhoek, with his single lens microscopes, influenced Vermeer’s use of the lens of a camera obscura to project images (and light) onto his canvas. But I wanted to know the opposite - how Vermeer and other artists might have influenced Leeuwenhoek. When I was in Delft, the house in which my family and I stayed happened to be on a lot used by Vermeer’s aunt, Ariaentgen Claes van der Minne, to pen her animals. The lot was just behind the houses of Vermeer’s mother and sister. Vermeer’s aunt sold tripe. She has largely been forgotten by history, or was until it was discovered that the alley beside her house on Vlamingstraat appears to be the same alley depicted by Vermeer in The Little Street. That we found ourselves sleeping in a house on the land where Vermeer’s aunt’s animals were fed, butchered, and buried was the kind of great fortune of which a biologist interested in art dreams. All the better that she sold tripe and I sometimes study the biology of intestines. But it got better. When the house we were staying in was built, the land beneath it was partially excavated. 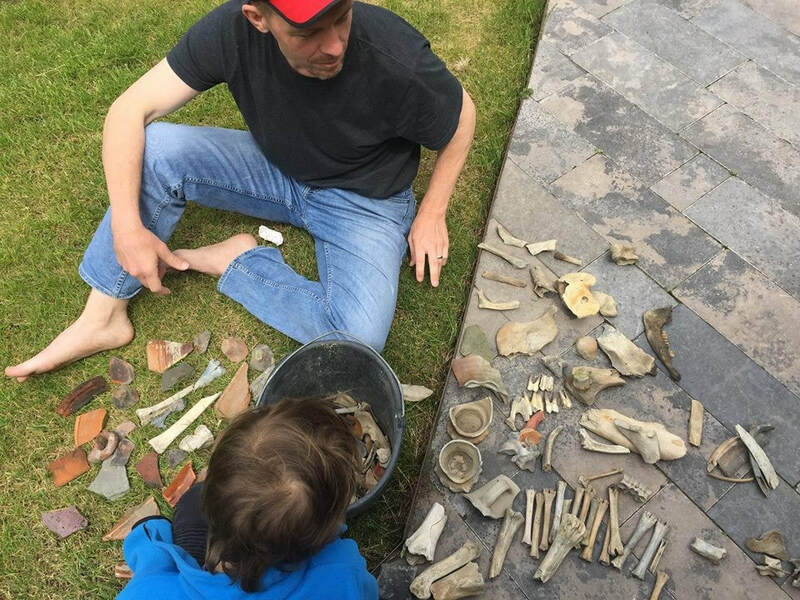 The archaeologists took what they thought to be important and left everything else, in buckets. In the image below you see my son and me sitting amidst the contents of one such bucket. Around us are the bones of pigs and cows, but also pieces of teacups and jugs (to the right of the bucket). You can see, for example, the base of what might have been a jug out of which milk was poured. Rob Dunn and his son sorting through material collected from the lot where Vermeer’s aunt kept her animals. Photo: Monica Sanchez. I tell the bucket and its contents because my moment among them led me toward a hypothesis about art, science, and Leeuwenhoek. Leeuwenhoek, and the painters of Delft, as others have suggested, used similar technologies. At least some of the painters of Delft used lenses to project images (and to see them in new ways). Leeuwenhoek used lenses and light to see new, tiny, worlds. They also used, of course, paint brushes and ink to call attention to details the casual observer had missed. But they shared something else, a common quarry. Vermeer and several dozen other painters of Delft, including Carel Fabritius (who painted The Goldfinch), and Pieter de Hooch (who painted many, famous scenes of houses as seen through doors), considered daily life. The painters depicted doors; Leeuwenhoek studied the dust on doors. They depicted food. He studied the life in foods. They painted cups. He looked at the life in cups. They implied the bones beneath bodies; he depicted the bones. The painters depicted men courting women; Leeuwenhoek drew sperm. In short, both artists and scientists depicted the sort of life the bits and pieces of living I could see living in the grass or dead in the bucket. In the lawn, with the bones and vessels, I was sitting amidst the quarry of the famous men of Delft, both scientist (and there really was just one) and artists. It was this I found awesome, as we picked through the bucket. For a moment I too held parts of their quarry. Maybe the discoveries of Leeuwenhoek and the paintings of Vermeer and others in Delft happened in the same time and place simply because of the particular culture and relative affluence of the moment. This would be unromantic and yet is possible. If there was an influence though, I think it was not (as is often speculated) via a simple exchange, such as that of Leeuwenhoek offering Vermeer a lens, but instead through the creation of a culture (and with it many influences and exchanges) in which art and science, at every intersection had something to offer each other, something to offer in light of shared tools, shared physical acts (be they of depicting or of arranging a scene), and a shared quarry. These conditions, I hypothesize, make it easier for insights to flow from one field to another. It can happen, even, in the work of a single individual. Leonardo da Vinci did some of his greatest work while dissecting bodies in the basement of the Santa Maria Nuova church. His dissections revealed new scientific insights (the discovery, for instance, of atherosclerosis), and yielded new art (the depiction of those tortuous arteries). In his moments beneath the church, the work of of artist and anatomist, the physical work, were indistinguishable. Both art and science required knives to see, metaphor to contextualize (the arteries were like rivers) and charcoal and brushes to depict. Then there was Alexander Fleming, the microbiologist. Fleming discovered antibiotics (it isn’t that simple, in neither art nor science, is it ever). He did so at a time in his life in which he was also painting. He painted using bacteria of different colors and growth rates which he inoculated strategically on Petri dishes so that at one moment in the growth of the bacteria, and one moment only, a picture would appear. He painted the queen for instance (and showed the image to her, she was unimpressed). This art required exactly the same physical skills as his work. The use of the loop to inoculate. The Petri plate. The bacteria themselves. It also involved the same attention to the unexpected, an attention that was perhaps Fleming’s greatest skill. Fleming needed to pay attention to the unexpected in order to spot unusual bacteria that he might need for his art, but it was also in paying attention to the unexpected that Fleming spotted a bacteria culture on which Penicillium fungi had, by chance, grown. A ring of dead bacteria surrounded the Penicillium fungi. That ring spoke to Fleming the artist. It spoke to Fleming the scientist. That ring was produced by antibiotics and thanks to that ring and the discoveries it precipitated millions of lives are saved each year. All of this is interesting, but might superficially feel useless, another attempt to retrace well-trodden histories with new, slightly different lines. Or it would be except that if it is right, that art offers the most to science when art and science have common tools, and common quarry (and often common physical actions), then it also offers a prescription for the sorts of modern contexts in which the two fields offer the most to each other, where artist and scientist might be mostly likely to thrive together. I think it is, and along with Gabrielle Duggan and Adrian Smith, offer a recent project as a kind of case study of what is possible. ​Research Lab at the North Carolina Museum of Natural Sciences. Photo: Raymond Goodman. Gabrielle Duggan is an artist whose work often takes the form of temporary installations made of woven fiber structures. Tension anchors her installations as they span from floor to ceiling, suspending objects in the midst of intersecting lines. Adrian Smith is a biologist who works on the behavioral biology of ants. Adrian’s research often entails examining diverse ant societies, ranging from 10 individuals to 100,000s, and asking how these individuals cooperate to form a functional society, how the pieces make a whole. Gabrielle and Adrian met at my prompting. I’d brought together Gabrielle along with Adrian and a group of other scientists focused on the places animals live, homes constructed of tunnels and chambers. At first, the connection was awkward. The language of art and that of science have become different. There was in the first meeting, a sense of dancing. Something raw and exciting was in play, but without in the way of rhythm or choreography. The first good step forward came from Gabrielle. She noticed, in our very first meeting, something all of the scientists gathered had missed. We’d pulled out, by way of explanation of our work, a series of drawings of the nest structures of rodents and then also photographs of casts of ant nests. It was the latter to which Gabrielle was drawn. For more than 50 years ant biologists have depicted this architecture by making casts of underground, excavated nests, casts rendered in metal, cement, or plaster. Casts of full-size nests range in vertical scale from inches, to human-sized, to too-big-to-get-out-of-the-ground-and-display. These casts are made by scientists to see what is invisible in order to understand more about how ants build and carve, and just what needs to be explained. We were trying to think of new ways to compare these nest structures, both for particular species of animals and among them. Gabrielle, right away, noticed something we had all missed. We were talking about the structures using the language of architecture, as though the ant nests were apartments. Gabrielle noticed though that the casts looked more like subway systems. If you traveled down one of the tunnels of the ants, deep into the Earth, passing from one chamber to another, you often arrived at a dead end. You have to come back up to the top of the nest to go down another tunnel. The tunnels, she said, if you spread them out, are more like subways than roads. This was true and biologically interesting; it presented us with new questions. Still though, the conversation, although fascinating, was clumsy, a slightly raw start, without a defined direction. Then Adrian invited Gabrielle to the field, to go see ants and to study their nests with him. For both Gabrielle and Adrian, the act of being together on the same space, be it the field or the lab, carrying out similar (or even shared) physical tasks (pouring the plaster, digging out the plaster, hanging the plaster) made it easier to find a common language with which to talk about their work; even where the specific terms used in ant biology and fine art are very different, those for the physical work were less so. The experience in the field with Adrian affected Gabrielle’s art directly; she used the material from the work, what she saw but also the cast itself, to transform an ant nest cast to an art object. Gabrielle chose to arrange the cast as a fragmented deconstruction of an ant nest. The cast was not to be confused with an actual ant nest; its presentation emphasized its state as a referent, an image build of objects and yet referent to a process. To Gabrielle it was important to capture that the cast was not just a reflection of the original nest, but also a reflection of the nest and its colony in a particular ephemeral moment, much like a photograph might be. But could this process also really shape the science, the science Adrian was doing, or was it “extra,” a way for Adrian to enrich his experience but without direct benefits on his ability to make discoveries? In this case the experience in the field and lab with Gabrielle directly altered Adrian’s science. For Adrian, Gabrielle’s work reframed what casts of nest architecture are. 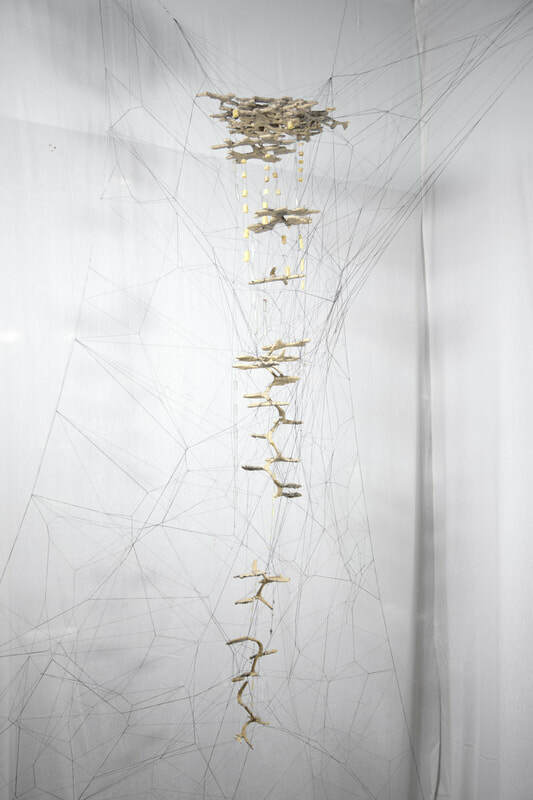 By choosing to suspend the cast in fragmented bits, rather than displaying it in the form and connectedness it came out of the ground in, Gabrielle’s work emphasized the impermanence of the nest to which the piece referred. The hard plaster of the nest “was” permanent, but what it spoke to, what it “said” in the context of Gabrielle’s art, was something instead about the ephemeral. To Adrian, seeing the cast this way reminded him of a reality often forgotten by ant biologists, that the cast, although seemingly finished, is really a snapshot of a temporary condition of that colony; more of a work in progress than a finished piece. To scientists, ant nest architecture is known to be fluid in some ways. Nests expand and deepen as a colony grows larger. But what if by only admiring snap-shots of these forms we are missing even more fluidity in how ants construct and inhabit their nests? What if there were finer scale changes in architecture that were happening daily, and ant nest architecture is never actually declared done? So, Adrian started experimenting with the ants. A 24 hour time-lapse video from those experiments revealed the process of nest digging to be more than just excavation. While some ants move soil and hollowed out more livable space, other ants constructed walls, refilling and refining the space that had already been excavated. This meant that even in a short 24 hour period, nest architecture was observably fluid, constantly changing. 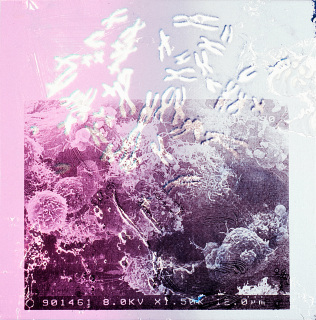 Gabrielle and Adrian’s collaboration evokes the history of art and science and some of the most powerful moments in both fields (Leeuwenhoek and Vermeer, Leonardo, Fleming), but it also offers something else, a way of imagining a series of collaborations between artists and scientists built not around insights or concepts, but instead around the common efforts required of both fields. I often host artists in my lab or facilitate connections between artists and scientists. The experience of Adrian and Gabrielle, along with my epiphany among the bones in Delft, made me think differently about how to make partnerships between artists and scientists most effective and also which such partnerships, in the past, had most influenced scientific discoveries. Here I mean the big past, but also my own specific past. ​The year before we had tried another collaboration with artists. This collaboration was focused, like the work on ant nests, on understanding a common quarry; in this case the external skeletons of ants. Under a microscope, the skeletons of ants are often ridged and punctured. The structures of different ants are wildly different, but these differences have gone largely unstudied by ant biologists. In the context of an undergraduate student class, Clint Penick, a group of postdocs, the students and I came up with the hypothesis that perhaps these bumps related to the ways in which ants defend against pathogens. Maybe the ants with bumpy exoskeletons favored beneficial bacteria that, in turn, helped to defend against pathogens. The divots on the exoskeletons were habitats, or could be anyway. This has become an area of art and science exploration, and the first step was documentation of the patterns. I hired Meredith West an artist who works with textiles to work with Clint Penick and Adrian Smith to document the exoskeletons of the ants. Meredith would come to use tools similar to those Adrian and Clint use, but metaphors and language that were new to them (the concept of motifs for instance), to consider a common quarry. The results were a new approach to depicting the morphology of the ants, an approach more useful to science than the one that had been being used by scientists, but also the prints, that you can see below, new to art. To Meredith, each of the prints has meaning as art. To Adrian and Clint, each print shows the pattern of a particular ant’s head, patterns that evolved under natural selection for particular functions, patterns Meredith helped make easier to see and hence explain. The collaboration, grounded in common tools, common quarry and unique metaphors, like that with Gabrielle, “worked,” for both the artist and the scientists. Heads of worker ants (Aphaenogaster lamellidens; left), show ridged surface structures. 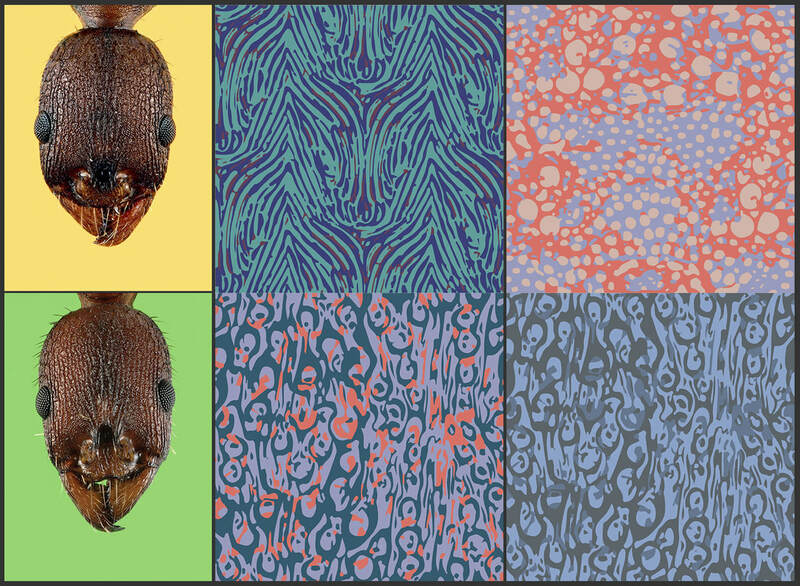 Pattern prints (right) derived from the surface structures on other ant species. Images by Adrian Smith (left) and Meredith West (center and right). ​We will host many more artists in our labs at North Carolina State and the North Carolina Museum of Natural Sciences. And we will do it now, while keeping in mind the benefits of shared tools, shared tasks, novel metaphors, and shared quarries. But we also hope to extend just what the quarry can be. So far the examples I have shared are cases in which the quarry is something physical, be it the life in houses, arteries, the growth of bacteria, the nests of ants, or the skeletons of ants. But the common quarry can also, of course, be conceptual. But this is harder. Several years ago we hosted an artist in the lab named Miella Green. Miella was working on a project called “One thousand galaxies,” in which she was using the wax of bees to depict life as it might be, life in other circumstances. What Miella asked for from us was a place to do art surrounded by scientists. Her goal was never to, explicitly, to collaborate and yet her presence in the lab offered the potential for collaboration; I imagined one might appear organically. But none ever happened. In retrospect, I think I know how I might have made a collaboration more likely. I kept showing Miella the science we were working on and talking about physical observations, what species looked like or did. But that wasn’t our common quarry, our common quarry was instead, the way in which life evolves, it was natural selection and the evolution of life. I hypothesize that had I brought together Miella along with scientists from the university focused on the general rules of life’s evolution, that a collaboration might have emerged, a collaboration grounded in a common concept as quarry, rather than common object, but one that would have been most exciting if the scientists were to then be the ones to do the extra work, the extra work of thinking about how they would, in wax or other material, display their understanding of the evolving living world. The good news is the opportunity is not lost. Miella is still in Raleigh and so, at the next opportunity (and if Miella is willing) we will try. Eighteen of one thousand pieces in Miella Green’s series “One Thousand Galaxies.” Each piece is 95% beeswax and 5% other materials. Photo by Miella Green.